By 2020, 85% of all customer interactions will be handled without a human agent. But does that sound the death knell for human interaction in customer service? Much like the future of retail, the future of customer service is one of unification. A harmonious blend of AI-powered bots backed up by human empathy and smarts. But why are businesses so keen to make the shift to automated bots? And how can you make sure they genuinely help you serve your customers in the right way, on the right channel, every time? Look at it this way: 8 out of 10 customer inquiries are repetitive. That gives you a huge opportunity to delegate inquiries to bots and reassign your human agents onto more complex, empowering areas of engagement. But what happens when your chatbot encounters an unconventional query it can’t handle? You’re going to need a human with the knowledge, empathy and problem-solving skills artificial intelligence fails to emulate. Especially if your customer is showing clear signs of frustration and anger – the last thing you want is a bot hurting your brand reputation. 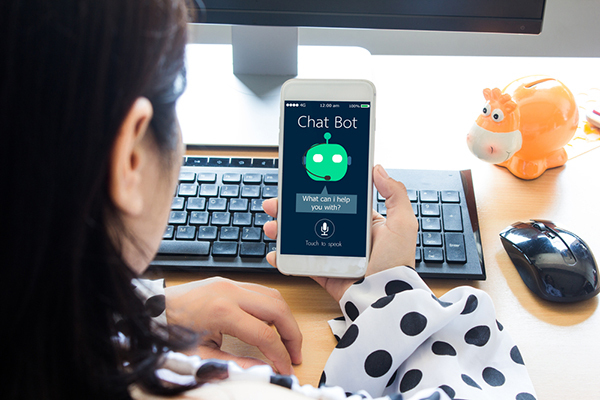 The shift to messaging apps – led by the likes of Facebook Messenger and WhatsApp – opens up the ideal platform for chatbots. Together, they offer a simple, unobtrusive, and seamless self-service experience that fits neatly into customers’ daily lives. So, where does that leave human agents? Aimee has just invested in a new suite of illustration software, but she’s having trouble installing it. Jumping online, she strikes up a conversation with a chatbot. The bot immediately scans her order history and begins offering personalised advice regarding her software. Happy with the advice, Aimee logs off. Sadly, the solution doesn’t work. Back on live chat, the bot recognises the severity of the case, and alerts a human agent to get involved. Thanks to the intelligent service platform, the conversation moves seamlessly from bot to human, allowing the agent to resolve the case quickly and empathetically. Don’t present your bot as a human. You need to be up-front with the customer that this is an AI. But with that in mind, don’t hesitate to use it as an opportunity to show how fast, accurate and efficient your bot can be. As your business grows, so too will the number of customer enquiries you field. A chatbot is only as good as the knowledge you give it, so it’s critical that you integrate it with your CRM system and keep it connected to that growing data source. If the bot can’t deliver the right solution, ensure your service platform has the capability to flag a human agent for a seamless takeover with the information they need to resolve the case – fast. Think back to best customer service experiences you’ve ever had. Chances are, they were great because they were simple, easy, and fast. With a power couple like AI bots and human agents on your team, you can recreate that experience for your customers – at any scale. Underpin your customer service with the power of Einstein bots. To find out about how, explore Einstein Bots on Trailhead, the fun way to learn Salesforce. Alternatively, download the second edition of the "State of the Connected Customer" report for data-driven insights on how to drive great customer service experiences to those ever-more-demanding customers.